Anna Sofaer, known for discovering the Sun Dagger site on Fajada Butte at Chaco Canyon, New Mexico, is giving a presentation on Chaco Astronomy: An Ancient American Cosmology , also the title of her new book. She plans to sign copies of her book at the Otowi Station Bookstore next door to the Bradbury Science Museum prior to her talk, from 5 to 7 pm. 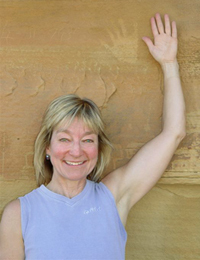 Visit Anna Sofaer's website, The Solstice Project, for more information about the event, and about the Sun Dagger on Fajada Butte. One of the things I love about Chaco is the incredibly dark night sky, the kind that absolutely takes your breath away. I was willing to bundle up and brave temperatures in the low 20's on a night in early December, just to look through telescopes at a sky that magically cleared after days of stormy weather. Our handful of hearty souls was gifted with views of Jupiter and its moons, the Andromeda Galaxy, several nebulae (often looking like beautiful and whimsical creatures), Comet Holmes, and, of course, a brilliant Milky Way. The Chaco Observatory is pictured to the right (photo from the NPS Chaco Night Sky Program website - do check it out). I will be providing useful resources related to Chaco in periodic posts, all filed under the category "Useful Resources." I highly recommend you begin here, at the national park service's Chaco website (Chaco Culture National Historical Park), which is full of great information. Browse around, spend a little time. Be sure to check out the photo gallery. This will show you some of the beauty and character that draws so many of us back. 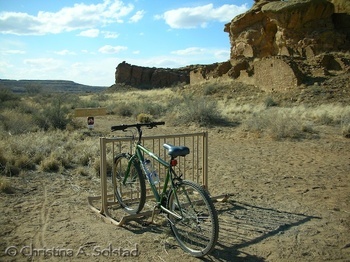 In brief, "Chaco Canyon was a major center of Puebloan culture between AD 850 and 1250. The Chacoan sites are part of the homeland of Pueblo Indian peoples of New Mexico, the Hopi Indians of Arizona, and the Navajo Indians of the Southwest." Chaco is located in the northwest corner of New Mexico, about 150 miles northwest of Albuquerque, in the high desert at an elevation of 6200 feet. Access from either the north or south is via ~20-mile dirt roads, and visitors stay in Gallo Campground (tent or RV), which (thankfully) has flush toilets. The tent sites are in a beautiful rincon (click on the photo of my campsite to the left, taken in October 2007). Those who come really want to be there. Believe me, it is worth it.